Heat the olive oil in a pan. Add the onions & sauté till transparent. Add the ginger followed by the chopped carrots & parsnip. (You could add some dried herbs too at this point depending on your taste.) Cover and cook till the vegetables soften. Cool & then blend/puree the mixture. Meanwhile, in a separate pan, prepare the white sauce. Melt the butter, blend in the flour, salt & pepper. Add milk gradually, stirring constantly, and cook until the mixture begins to boil. Add the vegetable puree to this & continue cooking for 10 minutes or so, stirring constantly. Adjust the amount of milk depending on the consistency desired. Garnish with chopped herbs & serve hot. Update: I am sending this over to Tami at Running with tweezers who is hosting the Second Annual Super Soup Challenge . What a pleasing color for the soup. 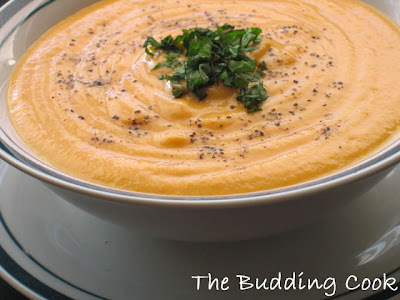 I've tried one with ginger and carrots before - great combination. haven't cooked with parsnip though. Root vege soup? Fall already in the air? Looks lovely..
Yum! This looks like a wonderful fall dish! Thanks for sharing it! Ginger should be adding to the taste. I will try it sometime. Hi TBC thanks for visiting my site. You have some wonderful recipes. I'll be back to read more. 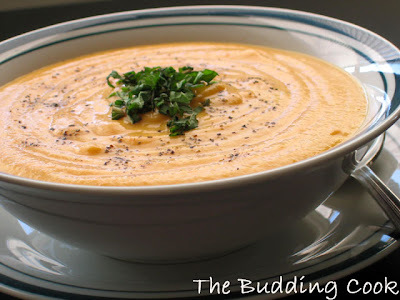 carrot soup with white sauce is really unusual, but i can imagine how yummy it must be. What an exceptionally beautiful picture! And the soup - creamy as can be. Great job all around. mmmm thick n creamy :) will take soup any time! The soup colour is looking so pretty, picture is excellent :) Soup recipe is easy to make. What is parsnip ? Lokks delicious and I loved the pic!! Nice color!! Nice soup! The colour is very pleasant. Ginger is good from health angle also. Jendz, thanks for stopping by. Asha, thank you:-)It was very thick and creamy,hence the swirl on the top. Seec, thank you. My list is loong too & I have to organize it someday! Barbara, thanks for stopping by. Bee,I did not know that white sauces are to be used only with certain kinds of soups/ veggies. Welcome Mythili! and thank you. Richa, yeah me too! though it's not yet fall/winter. Parsnip is a root veg, looks a little bit like radish 7 has a slight nutty taste. Thanks! I think I did not add enough ginger, the ginger flavor was not that obvious in mine. Cinnamon, welcome & thanks for visiting! Like I said earlier, I can't access anything on your blog. You would need to first go to " Settings" and make your profile public before people can start visiting you. Hope u come back to read this.What is the name of your blog? Sia, thank you:-)You are so sweet to say that. Happy Independence Day to u too. Welcome to my blog & thank you. lovely pic too.. and congrats on your award! Nags, thanks for the compliments. Actually, the white sauce was used to make 3 servings so it was not a lot of fat, but yes, if you are on a diet you could even do without that, I guess. It has a pretty thick consistency. What a beautiful bowl of tasty goodness!